Any piece of jewelry or small trinket, stone, coin etc…. can be made into an amulet. An amulet is an item that is charged with psychic energy to attract a like energy. So if you want to make a money amulet, then use something that symbolizes money to you. This might be a coin, or jewelry with a certain type of stone that has to do with abundance, or it could be a gemstone that is known to attract money (iron pyrite, aventurine etc..). Once you have your item, now you can bless it. To do that, you hold the item in your hand and really concentrate on what you want this amulet for. Ask your deity(ies) of choice, angels, spirit guides etc… to send forth energy to empower your amulet. When you can feel that this has happened, thank them for their help…. And know deep within your soul, that help is on it’s way when the time is right and in the form that suits your needs best. One thing you can do to make it easier… is to use incense, sage or burn herbs over charcoal tablets that support your desire. For example: patchouli, cinnamon and clove are money herbs. You can burn any one of them in the form of incense, candle or the actual herb to empower your amulet. Light the incense or candle and hold the amulet in the smoke (or warmth of the candle). If you have purchased one of our spell amulets, as you hold the amulet in the smoke, recite the incantation on the pendant. Over time, an amulet can lose it’s energy. You can repeat this mini ritual when you feel the need. It’s a good idea to do this monthly on the full moon (when the moon is at it’s strongest). I wish you blessings of happiness, peace, prosperity, good health and love. Rose quartz ranges from pink to cream in color. Rose quartz is considered the “stone of unconditional love”. It has a very soft and gentle energy. It encourages one to be open and receptive to love, beauty, kindness, harmony. Rose quartz may allow one to attract love into their life. This might be a general love of mankind, family love or it could be a romantic love energy or a combination of all. Rose quartz may also help in the areas of emotional healing and self-love which are crucial to attracting love of any kind. The beauty of rose quartz is the gentle calming energy that it brings to love in that there is no need to hurry things along. It allows you to take a step back and relax about matters of the heart. Rose quartz is believed to help bring harmony to relationships especially in negative and/or stressful situations. Rose quartz encourages forgiveness, compassion and tolerance. Rose quartz may help one overcome guilt, grief, depression or the loss of a loved one. It may help in the removal of fears, phobias, resentments and anger. Rose quartz may also help one overcome and release childhood traumas or abuse, neglect, and lack of love. It can help with reconciliation in any strained relationship. 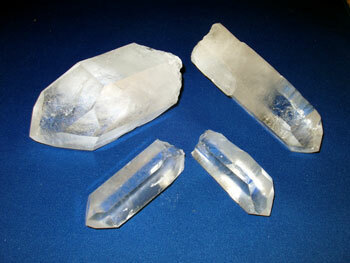 Rose quartz is believed to help in fertility, pregnancy and childbirth issues and in weight loss. Amethyst is a unique purple crystal with a mystical energy. Amethyst offers a calming effect to the bearer. Amethyst’s is a crystal of protective energy relating to the astral planes. This aspect makes amethyst a good choice for any type of spiritual work relating to: dream work… lucid dreaming, astral projection, past life regression, prophetic dreams etc…. Because of it’s calming effect in conjunction with protection, it is believed to help overcome insomnia and/ or nightmares and may encourage the bearer to feel very refreshed and energized upon awakening. Place a large amethyst crystal under your pillow or add to an herbal dream pillows. It works well as a gemstone elixir. Amethyst is believed to be a powerful stone of spirituality. Amethyst can be used as an aid to raise one’s energy vibration. Amethyst is connected with the deities Bacchus, Dionysus (gods of wine) and Diana. It is believed to help overcome alcoholism and other addictions. It is also believed to help one recover from the effects of a hangover. See my blog on how to make a gem elixir to help with these issues. Amethyst is a wonderful stone for meditation, tranquility and healing. It offers powerful spiritual protection on the spiritual planes of existence. So if you are doing any type of spiritual work, it’s a good idea to incorporate amethyst into your work. Amethyst is a powerfully psychic stone. It’s associated with the crown chakra which helps connect with the spiritual realm making it a very useful for those seeking spiritual guidance, healing, protection or wisdom. Program an amethyst crystal and store it with your tarot cards or other divination tool. Keep an amethyst crystal handy for spiritual protection if you work with an ouija board. Amethyst is a good choice for dowsing pendulums and rune reading because of it’s so conducive to psychic awareness. Amethyst can be used to attract love and happiness. It is a stone of pure emotional love and is often exchanged between lovers to strengthen their commitment.